So you have decided to propose! Congratulations! But how do you go about choosing an engagement ring? It is one of life’s most meaningful and romantic purchases that no one wants to get wrong. The job of selecting a piece of jewellery you hope your significant other will wear for the rest of their life can understandably cause a fair amount of stress. So here’s my guide of five key steps you can take to ease you through the process and relieve some of those pre-proposal jitters. Does she have a recurring style across multiple key pieces she loves to wear? For example, does she have lots of classic and vintagey jewellery? 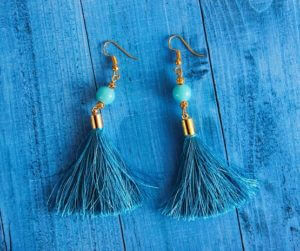 Perhaps she has really quirky taste in jewellery or maybe she goes for streamlined and sleek contemporary styles. Try to find a common theme amongst her most loved pieces and this will get you in the right ballpark in terms of design. Is there a predominance of one metal colour? Try to notice if she wears more silver, gold or rose gold-toned jewellery as this will help with the metal choice for an engagement ring. If you notice there is a lot of colour in their jewellery, is there an obvious favourite? When it comes to designing an engagement ring, I would suggest you try and find out whether your other half prefers white diamonds (or similar ‘clear’ stones) or whether they would like the idea of some colour in their engagement ring. They may wear bright and bold dress jewellery, but this doesn’t always correlate to wanting a coloured engagement ring. Your partner may have made their preference obvious to you if it has ever come up in conversation. 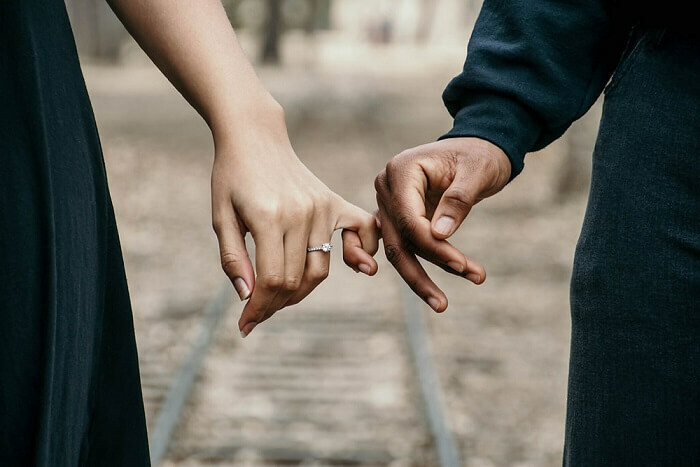 If not, you might want to get some close friends or family involved to see if your partner has revealed a preference to them – but be wary of too many cooks! If you’re unsure and your partner has not expressed a deep desire for anything other than a diamond, I would suggest you play it safe and opt for diamonds. Practically speaking, diamonds are the toughest gemstone out there, measuring 10 on the Mohs scale. Sapphires closely follow at 9 and so these are my top choices for engagement rings as you want them to stand the test of time. Find out more about diamonds here. Lastly, take a look at the scale of her jewellery. Does she wear jewellery with chunky beads, large gemstones or big metal pieces, or does she prefer smaller and more delicate pieces? This will help decide how wide the band should be and what size stones you could choose. TOP TIP: Other than her jewellery, her taste in watches can be a big clue to the sort of style she might want for an engagement ring, as after all a watch is usually something you wear every day. 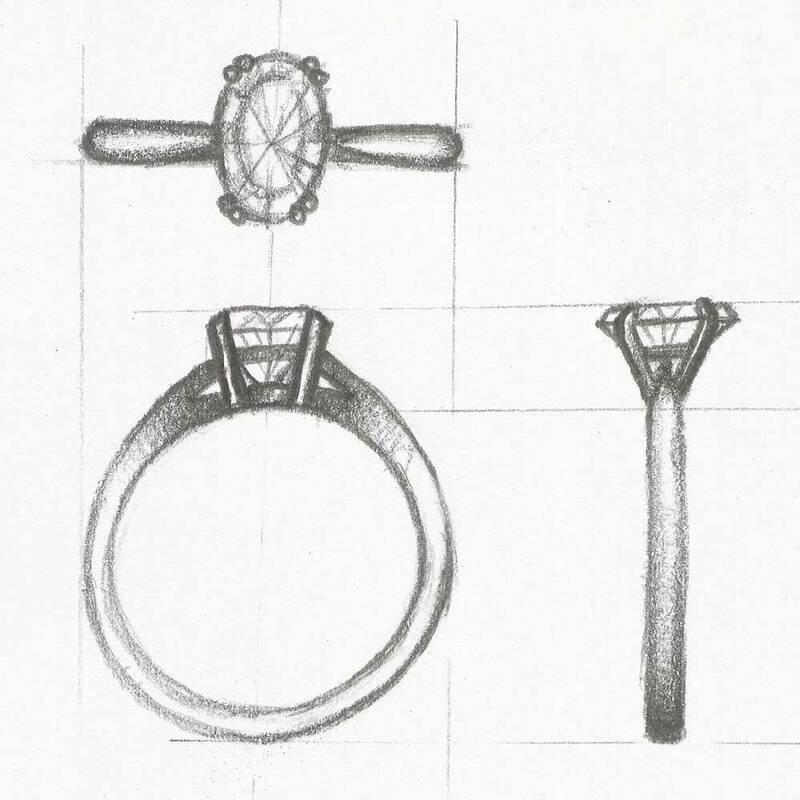 The answers to these questions above will give you a great starting point when choosing or designing a ring. 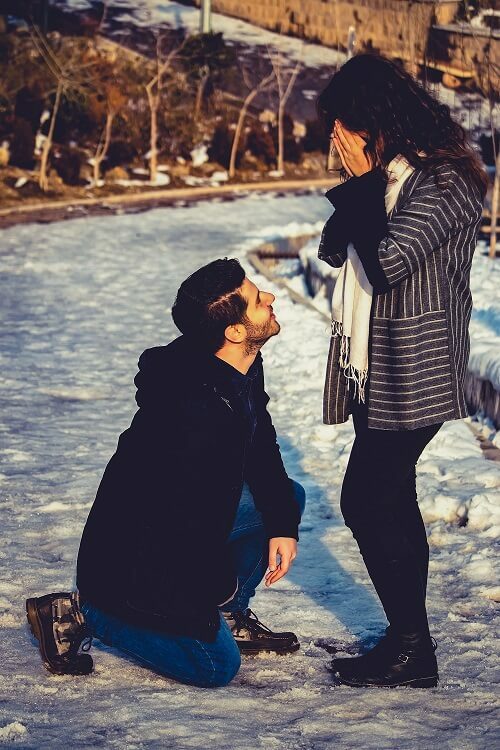 Get these key design choices right, and you’ll demonstrate that you’ve noticed and understood her style, which will only add to the romance of the proposal moment. 2. Consider her job and lifestyle. 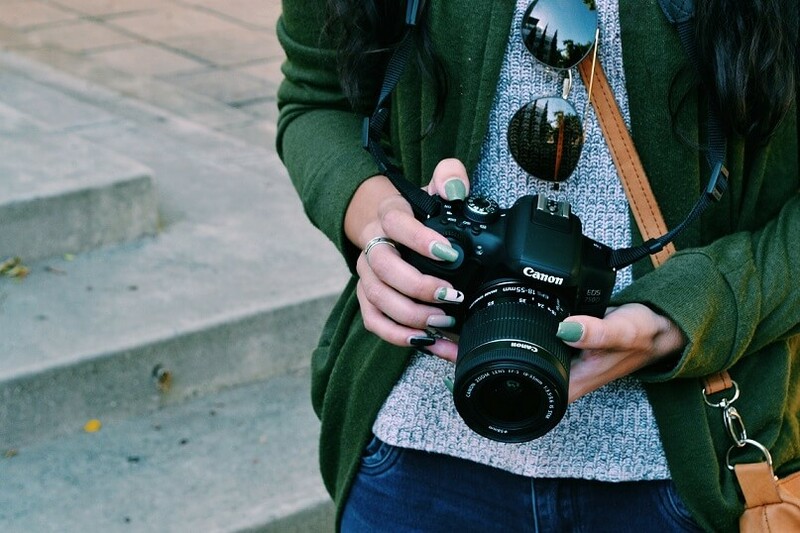 If your other half has a really hands-on job or has active hobbies and interests, this might influence some of your design decisions. If your loved one works with her hands, you might need to steer clear of really delicate claw settings or very pointed shaped stones which could more easily chip. It can also influence your choice of metal for the ring. No precious metal is indestructible and it is always best practice to take a ring off for any activities which may damage it or where the ring could cause potential for injury, however, a charmingly clumsy lady might find a platinum ring better suited than a gold ring as it is the most durable of the precious metals. You may decide that the ring would need to be removed for her work or hobbies anyway, so this may not be a big deal, but it is worth thinking about. A thin band and tiny claw setting may not work for all ladies, but if she likes getting her nails done and does not have a physical job, it might suit her perfectly. There are all sorts of ideas of tradition regarding how much to spend on an engagement ring – 1 or 3 months salary are common figures I have heard being bandied around. But the truth of it is that you should spend what you are comfortable and able to pay. You should never get yourself into financial difficulty for a piece of jewellery but equally, this is a gift that should probably hurt a bit. What this figure is will be different for everybody and there is no right or wrong answer. 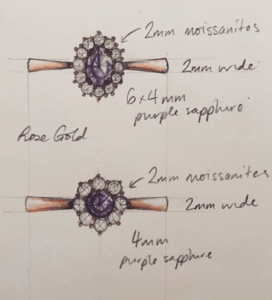 A quick browse on a jeweller’s website or in their window will give you an idea of the figures involved but of course your choice of stones, metal and complexity of design will impact the cost. I feel it is best to be upfront with your budget from the start because a good designer will work to that figure and not suggest designs outside of your means. This can be a tricky one if you want to keep the element of surprise. 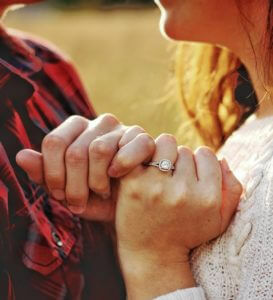 If you are unsure, show your jeweller a photo of your partner and find out their clothing size and rough height as these can be good indicators to help choose a ring size. It’s not an exact science and preference on how tight or loose a ring fits is very personal. 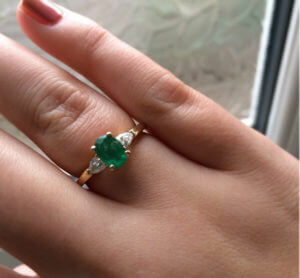 Err on the side of caution and go larger rather than smaller so you can guarantee the ring will go over the knuckle in the moment of the proposal. 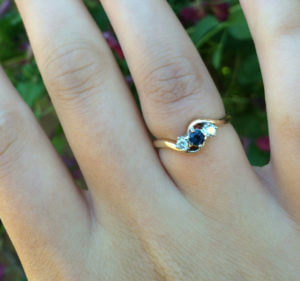 The vast majority of rings can be resized so try not to worry about this too much. 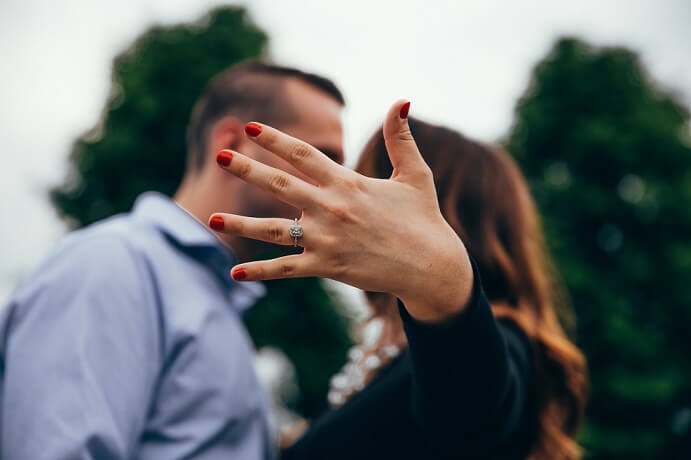 A basic understanding of the major trends in engagement ring jewellery and what the classic shapes look like can help you find a favourite that you think your future Mrs will like. A solitaire ring is the classic single stone ring. 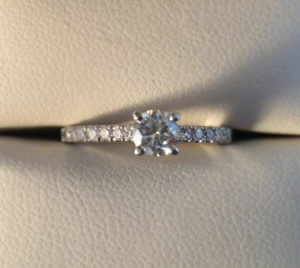 A simple and classic solitaire will have one central stone which is the main focus of the design. 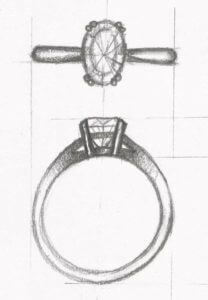 You can browse my knowledge pages for inspiration on band styles, setting styles and stone shapes to create your ideal solitaire ring. Solitaires can be kept simple, with all the focus on the central stone, but you can mix it up with complementary detail and added smaller stones on the shoulders. Below are three examples of some of my past solitaire commisions with added details. Megan’s emerald cut diamond ring has pink sapphires invisibly set in the shoulders of the band. 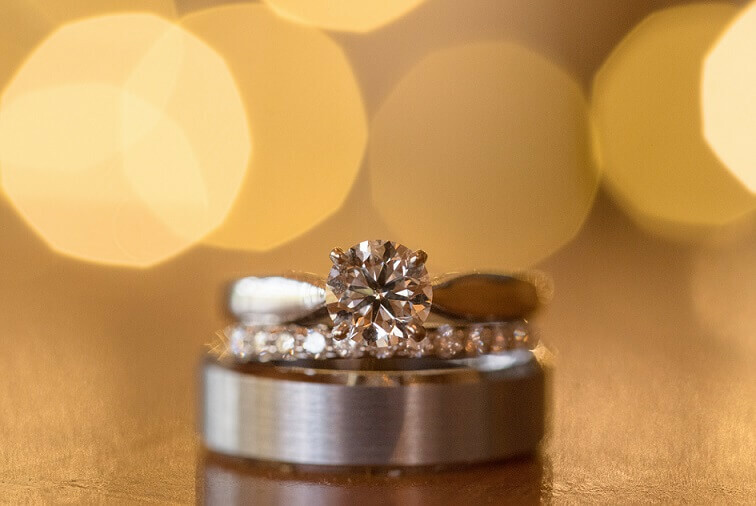 Charmaine’s sparkler has diamonds set along the band to create a solid streak of sparkle. Sarah’s mixed metal ring has stone set leaf shapes on the shoulders. A triology ring is another classic style with very romantic symbolism. These rings have three main central stones that are the key focus of the design and these represent your past, present and future as a couple. The stones can all be diamonds, or you could choose a mixture of colours and stones like the examples below. Both these classic styles can be designed to allow for a straight, un-fitted wedding band to slide underneath the central setting, or can work next to wishbone or curved wedding ring. A common design style I get requests for are twist designs. These give a modern and slightly quirky feel as the band wraps around the central stone. 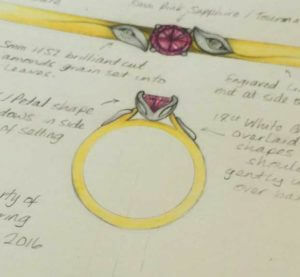 Something to bear in mind with these designs is that you will need a fitted wedding ring that will need to be specially made to work with the engagement ring. These can make beautiful and tactile wedding jewellery sets that look beautiful on the finger. Michelle’s palladium and tourmaline design is one of my favourites of this style. The Halo style is without a doubt the most fashionable engagement ring style of the moment. It is not a trend that is going anywhere fast, as it has been popular for some time now, so is not a fleeting fad. The interest in halo designs definitely stepped up a gear when Kate Middleton was given Princess Diana’s cluster style engagement ring. 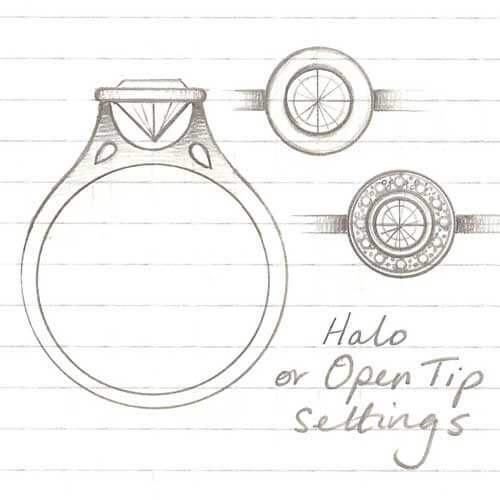 Both a cluster (where the surrounding diamonds are in individual settings) and a halo design (where the diamonds are set into a plate that surrounds the central stone in a modern way) have a ring of diamonds set around the central stone like a halo. These additional diamonds give an extra bit of sparkle and help to scale up the visual size of the central stone if your lady likes large rocks. Large diamonds can get very pricey, so a halo design around a slightly smaller stone can be a good way to balance the budget and desire for sparkle. Halo designs usually allow for straight wedding rings to fit snuggly beside them, which makes wedding ring shopping nice and easy. So there you have it – hopefully this guide has helped focus your thoughts on how to go about picking the perfect engagement ring. 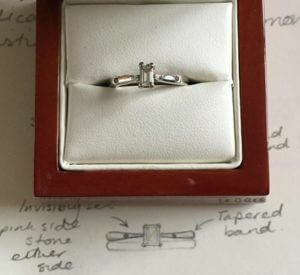 Once you’ve done your research on what you think your other half would like using the ideas above, go on a browsing mission, armed with your new found knowledge of engagement ring terminology. 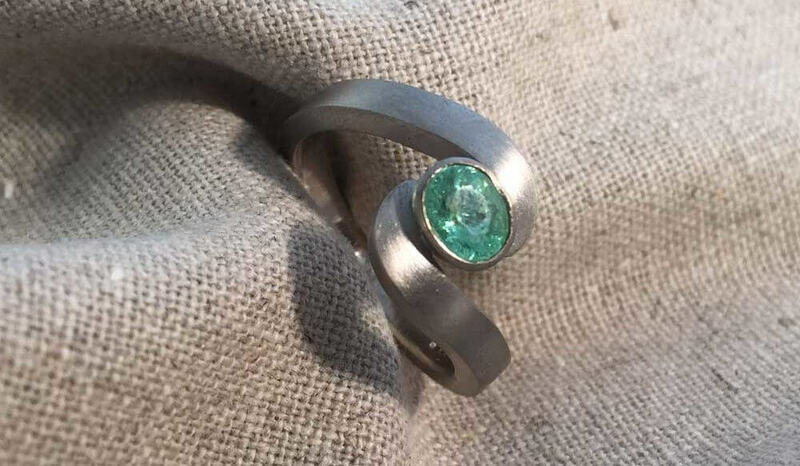 Take a look at my gallery of previous commissions for some ideas and take a look at Pinterest once you’ve got an idea of what you’re after, for example, a trilogy ring. If you’d like to have your perfect ring made from scratch – a unique ring for your one and only – I’d love to hear from you and help you piece together the perfect engagement ring.